The VONG choice! : Drumroll please! 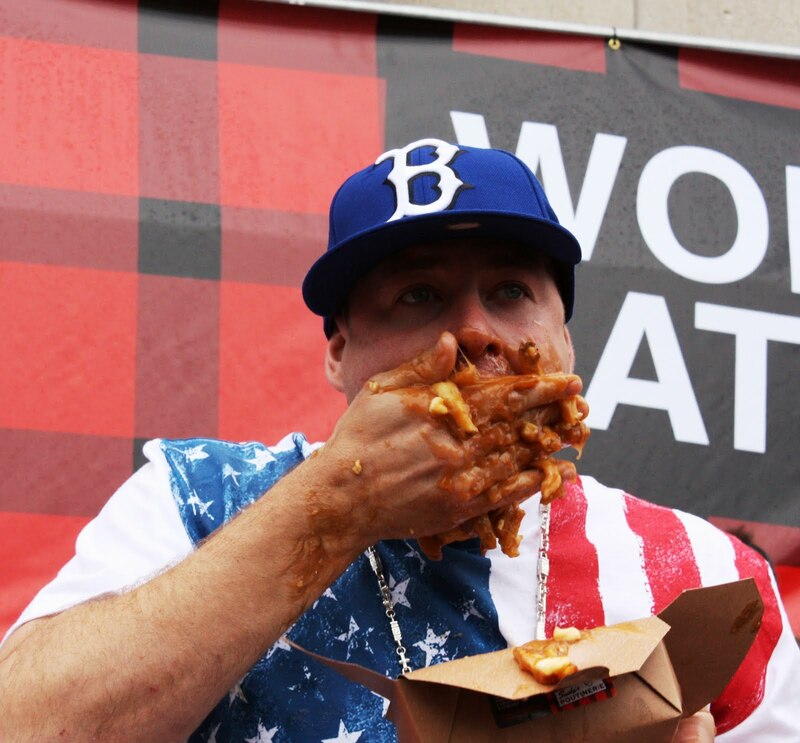 World's Largest POUTINE eating competition! Drumroll please! 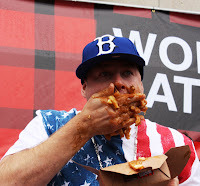 World's Largest POUTINE eating competition! 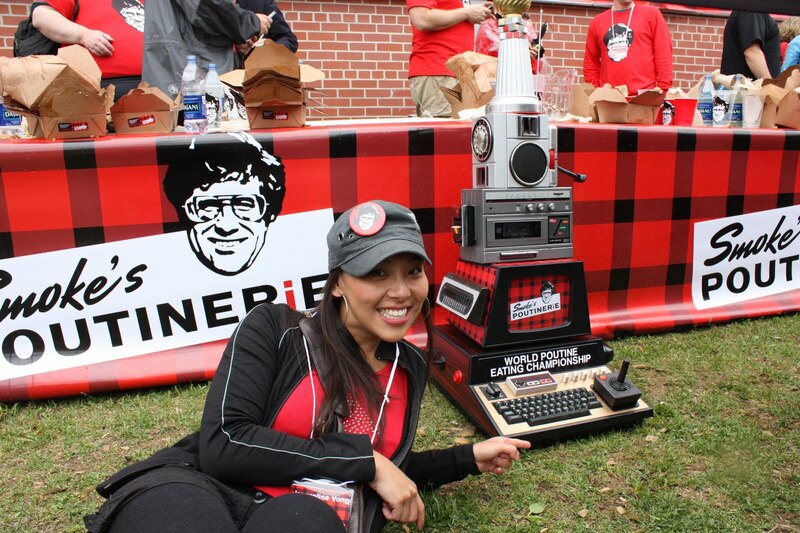 Toronto beat out la belle province to host the World's Largest Poutine eating competition sponsored by Smokes Poutinerie and fulfilling a dream of mine- I had the chance to witness and cover the whole competition on my blog *SQUEEL*!!! 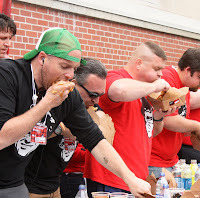 The contenders - heavy hitters from the Major League Eating Federation (MLE) came from far and wide to compete in this first ever competition against some local amateurs who qualified for their love and stealth for poutine and I was just a very happy lady to witness this all go down. #4 Ranked in the world in MLE- Patrick "Deepdish" Bertoletti (right) hailing from Chicago was the man around the competition to watch out for! 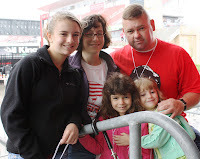 He has over 20 titles to tout about and comes from Chi-town. 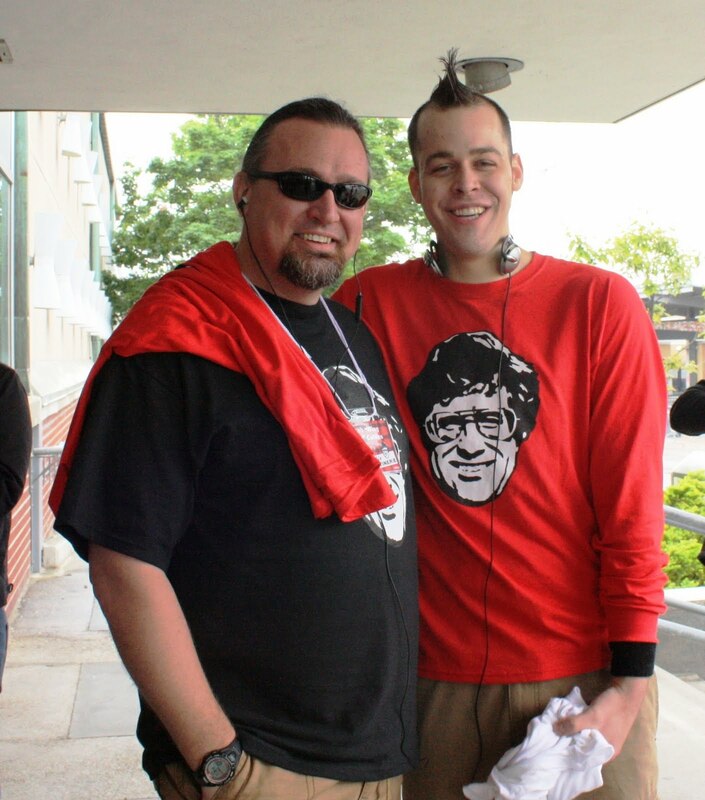 Some of his titles include 275 Pickled Jalapeno Peppers10 Minutes/May 2, 2010; 47 Slices in the World Pizza Eating Championship in 10 Minutes/November 8, 2008; and he has the record for many pie eating contests! 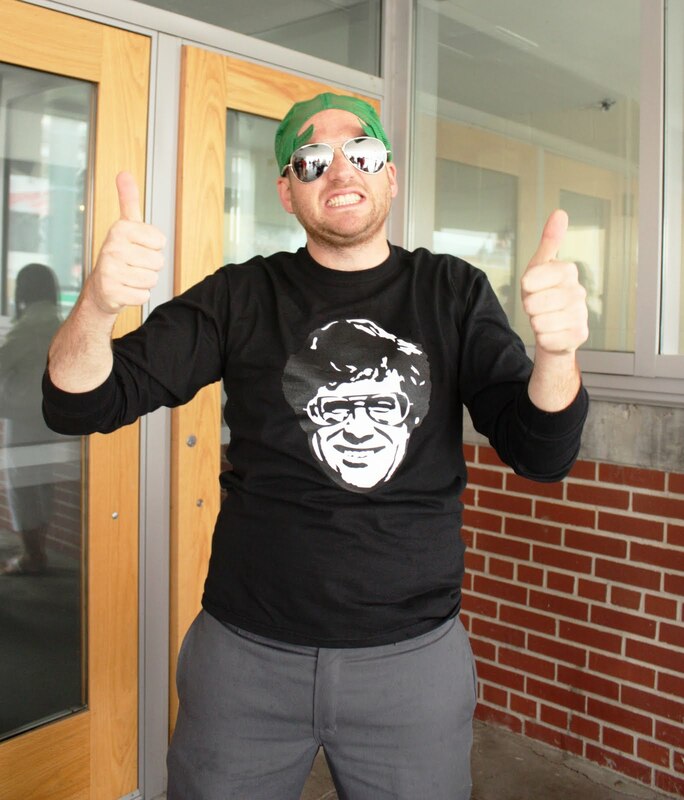 Interestingly enough Deepdish tried poutine in Windsor recently at a Burger King. 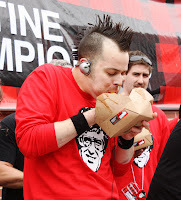 Ranked #10 in the MLE- Tim "Gravy" Brown from Chicago calls himself the junk food junkie. He holds the title for most Potato Wedges: consumed at 3.74 lbs Buffalo Wild Wings Potato Wedges in 8 minutes/October 18, 2007. He says that if he could created the ideal poutine - it would be from a local chi-town diner called "Susans" and it would be a deep fried tortilla filled with french fries slathered with MSG and BBQ sauce, liquid cheese and topped with all kinds of meatballs and gravy. Sounds delicious eh? #16 in the MLE- Buffalo Jim Reeves- a born Canadian who currently lives with his wife and daughters in upstate NY who holds the title for Watermelon at 13.22 pounds Watermelon in 15 minutes/ July 30, 2005. His ideal poutine would be yukon and gold potatoes blanched first then fried with garlic, Parmesan on an open faced country biscuit with breakfast sausages and gravy. There were others; ranked #14 "Crazy legs Conti" (putting his hair up) who holds the record for 3 1/2 pounds pancakes & bacon / 12 minutes from NYC; ranked #20 "Pretty boy" Pete Davekos who was not a pretty boy at all when eating his poutine! On the Amateur side there were 2 girls and one stand out named Ben Doo who did us Canadians proud and ate his heart out in the competition and came very close with 7lb of the poo but was no match to the pros. 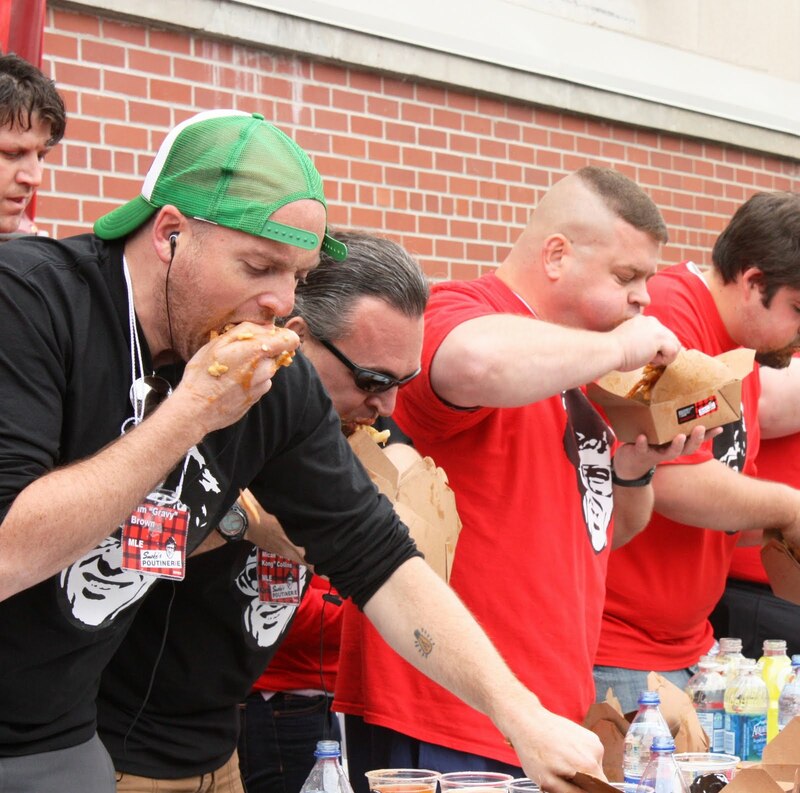 So out came the competitors; the pros had their powders to put in their waters, ear phones to play their own beats and a war stance ready to eat fiercely. 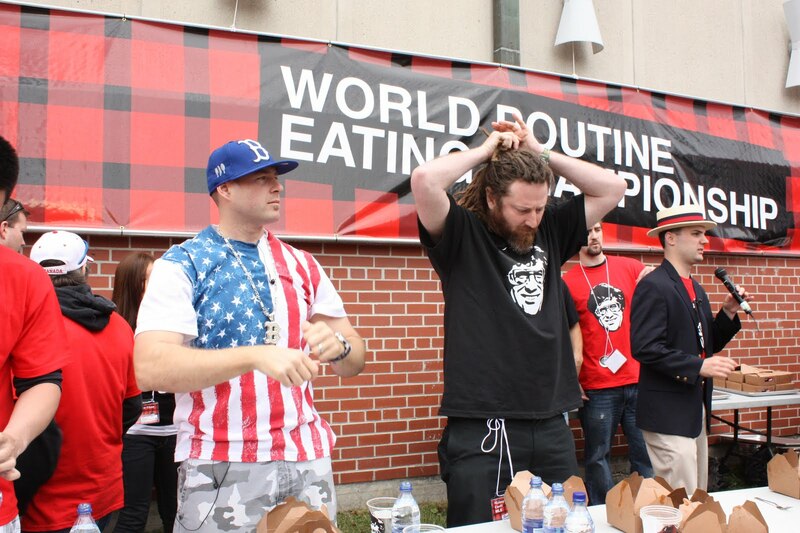 I watched this all go down and they were all suffering; poutine sweats - all over their hands, faces, coming out of their nostrils, pores and some even regurgitated and swallowed again. 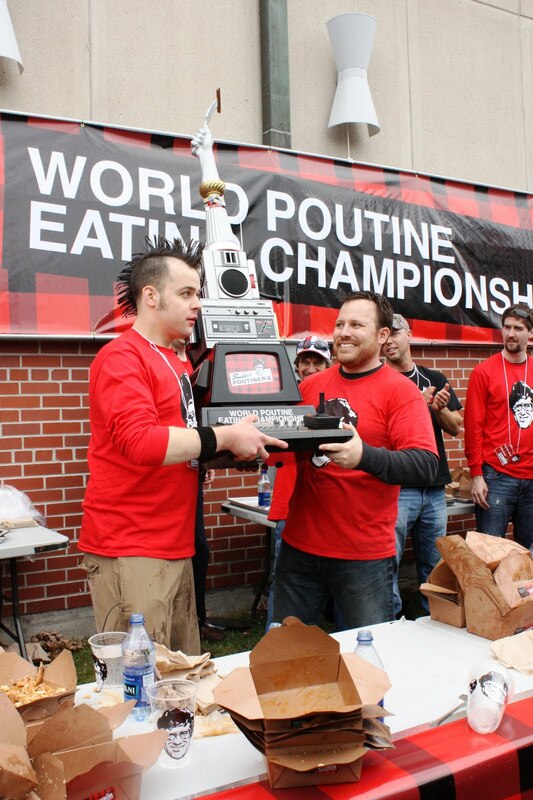 At the end of it all, it was Deepdish who reigned supreme and took the title of the most poutine had in 10 mins with a whooping 13lb!! Gravy took 2nd place, Buffalo Reeves took 3rd and Pretty boy took 4th place! 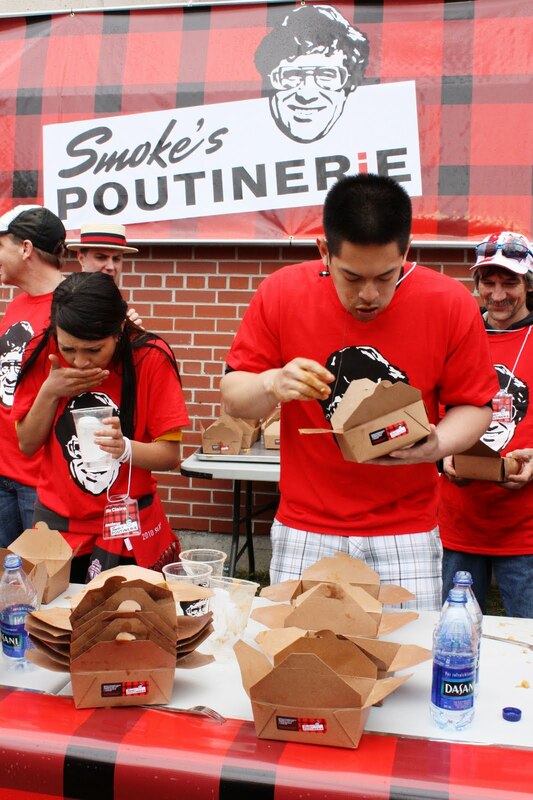 Thanks to Ryan Smoklin and the gang at Smokes Poutinerie for making this one memorable event!